HOn3 NORTH PACIFIC COAST #21 CAB FORWARD 4-4-0 "THE FREAK". 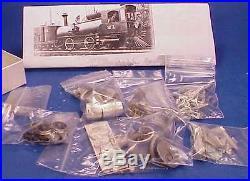 KIT CONSISTS OF WHITE METAL AND BRASS CASTINGS, DRIVERS, ALL GEARS AND WHEEL SETS. DOES NOT INCLUDE MOTOR OR MOUNTING BRACKETS FOR GEARS. A PARTS SET THAT WITH SOME WORK COULD BE MADE INTO A RUNNING LOCOMOTIVE MAKES FOR A GREAT CONVERSATION PIECE SITTING NEXT TO THE ENGINE HOUSE. NO WRITTEN INSTRUCTIONS ARE INCLUDED BUT EXPLODED DIAGRAMS AND DRAWINGS ARE INCLUDED. 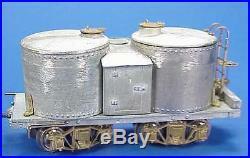 SEE OUR OTHER LISTINGS FOR MANY MORE NEAT ITEMS AS WE ARE LISTING THEM IN MANY CATEGORIES. The item "HOn3 WISEMAN MODEL SERVICES NORTH PACIFIC COAST #21 CAB FORWARD 4-4-0 PARTS SET" is in sale since Saturday, September 21, 2013. 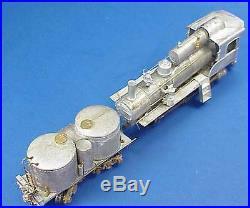 This item is in the category "Toys & Hobbies\Model Railroads & Trains\Narrow Gauge\Locomotives". The seller is "wisemodserv" and is located in Paris, Kentucky. This item can be shipped worldwide.